Dynamic Investment Theory (DIT) is a new approach to investing that replaces Modern Portfolio Theory. You will learn about DIT and Dynamic Investments on this site. They are the future of investing. The world of investing is about to change at a fundamental level. This change will come in the form of Dynamic Investment Theory (DIT) and the next-generation investment type that this theory creates called Dynamic Investments (DIs). You will learn about both on this site and by doing so you will be among the first to enter a more profitable, less risky world of investing. Developed by the Research Division of the National Association of Online Investors, Dynamic Investment Theory was created to be a superior alternative to Modern Portfolio Theory (MPT) - the "settled science" approach used for designing investment portfolios today. DIT establishes the logical basis and rules for the creation of Dynamic Investments, a next-generation investment type that automatically changes the ETF, and thus the assets/markets it holds, based on a periodic sampling of market trends. By doing so DIs are capable of consistently producing returns that are multiple times higher than any MPT-based portfolios with significantly lower risk and no active management required. Plus, they are incredibly simple to create, implement and manage. Whether you are an individual investor or an investing professional you cannot ignore the information presented here. Feedback from NAOI students who have field-tested Dynamic Investments in their "live" portfolios shows us that DIT, not MPT, is the future of investing. Allow me to introduce myself as Leland Hevner. I am the President of the National Association of Online Investors (NAOI). Founded in 1997 the NAOI is an established investor education and investment research organization located in Tampa, Florida. Here are links to my CV and to the NAOI Pressroom, both of which are found on the NAOI Corporate Site. The site you are currently viewing is dedicated to explaining Dynamic Investments - our most recent, and our most important, development. Since 1997 I have taught thousands of individuals how to invest via my books, seminars and college-level classes. Then, in 2008, I stopped all NAOI education efforts. Why? Because what I was teaching wasn't working. For over a decade I had been teaching investment portfolio design based on Modern Portfolio Theory (MPT) methods - using asset allocation to match each student's risk tolerance. During a college class I was conducting in 2008 the stock market started to crash and I watched in dismay as the portfolios I was showing my students how to create were crashing right along with it. At that point I had to realize that "static", buy-and-hold MPT-based portfolios simply did not work in modern, volatile markets and I was doing my students no favors by teaching it. I, therefore, cancelled all future college classes and refocused NAOI resources on developing a new approach to portfolio design and investing in general that did work in today's markets; one that I could feel confident teaching. As we started our research, I quickly saw that at the root of the problems facing investors today is the universal use of Modern Portfolio Theory (MPT) to design portfolios. This is a methodology introduced in 1952 . Click the chart at right to see the MPT problem (and the DIT solution that you will learn about on this site). 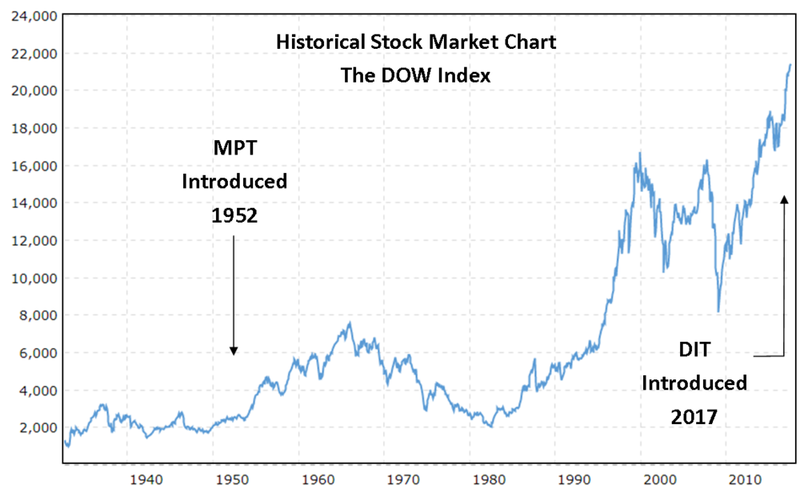 While markets have change dramatically since the 1950's, MPT has barely changed at all and it simply no longer works in modern markets. Yet we are still given MPT-based portfolios today by the financial services industry, resulting in investors having to accept mediocre returns, at best, excessive risk and no protection from market crashes..
MPT methods, by focusing their design on the risk tolerance of each investor, have no sensitivity to market changes. Their value, therefore, drifts up and down at the whims of the market. This is unacceptable in today's volatile markets and the reason why many individuals are not participating in the market today, or if they are, not taking full advantage of its wealth generation potential. Total reliance on MPT portfolio design is keeping the world of investing "stuck" in the 1950's. Having identified the root of the problem we started a development effort to create an investing approach that works in the 21st Century. To develop an updated theory of investing we used rigorous scientific methodology, starting with the ONLY thing we know about market price movements with any degree of confidence - this being that the prices of assets, markets and market segments are all cyclical in nature and that they move up and down at different times. Starting with this foundation of fact, we formulated a hypothesis that a portfolio, or investment type, could be created that was capable of automatically detecting positive price trends where ever and whenever they exist in the market and capturing their positive returns while avoiding areas of the market trending down in price. Extensive testing and analysis showed us that our hypothesis had a high probability of being correct. With these results we transformed our hypothesis into a theory and Dynamic Investment Theory was born. DIT sets forth the logic and rules for the creation of a new investment type called Dynamic Investments. Dynamic Investments are a new investment type that are designed to automatically change the Exchange Traded Funds (ETFs) they hold based on a periodic sampling of market trends. Whereas MPT methods dictate that portfolios must hold both winning and losing investments at all times for the sake of lower risk, DIs strive to purchase ONLY winning investments using a buy-and-sell strategy based on empirical market observations and not on subjective human judgments. Extensive testing has shown that DIs are capable of consistently delivering far higher returns than MPT portfolios with lower risk and NO active management needed. And because DIs are both market-sensitive and "time-diversified" they are capable of producing positive gains in any economic environment. Dynamic Investments are discussed in more detail on this Web page. For a quick DI primer go here. To illustrate the power of DIs, presented below is a table that shows the amazing performance of the NAOI Basic DI. This very simple investment automatically rotates only between a Stock and a Bond ETF based on which is trending up in price most strongly at the time of a periodic review. The table compares the performance of the Basic DI with that of a traditional MPT with the asset allocations shown. Displayed are the Yearly Returns of each investment type for the 10-year time span from the start of 2007 to the end of 2016, along with an Average Annual Return in the second to last column. The Sharpe Ratio, in the last column, is a measure of how much return is earned for each unit of risk taken - the higher the better and anything greater the 1.00 is seen as a superior investment. An average annual return of +30.6% with a 1.18 Sharpe Ratio for a 10-year period that included a major stock market crash is astounding. Why is the DI performance so superior? Because while the MPT portfolio in this table held BOTH stocks and bonds at all times during the period shown - the Basic DI automatically alternated between owning the Stock ETF and the Bond ETF depending on which was trending up most strongly. While MPT portfolios are designed to hold both winners and losers at all times in order to reduce risk, DIs strive to hold ONLY ETFs moving up while selling or avoiding those moving down. The DI management strategy reduces risk AND enhances performance! Performance like that shown in the table gives us confidence DIT, not MPT, is the future of investing. It would be a major mistake to view Dynamic Investment Theory as a "trading system." It is much more than that. DIT is a new, unique and comprehensive theory of investing that will effect virtually every area of the financial world. And by evolving the core methodology for designing portfolios from MPT to DIT the ripple effects throughout the industry are many and significant. We have documented just a few of these major changes on the Web page entitled "The Future of Investing". As one example of the magnitude of this change, Dynamic Investments "productize" the world of investing. This is the Holy Grail of the financial world that experts have been seeking for decades. They haven't found it. With DIs, the NAOI has. Both individual investors AND the financial services industry should welcome Dynamic Investments with open arms. By removing the constraints of MPT portfolio design and methods, the world of investing is free to advance in many areas and extremely profitable directions. The following people / organizations will benefit significantly in the DIT-based world of investing. Click the links to go to a more detailed discussion of each.. If you or your organization fit into any of these categories you must read the information provided at the links above and elsewhere on this site. If your competitors read and act on what is presented here and you don't, they will gain a tremendous competitive advantage that will be very difficult to overcome. Change of the nature discussed on this site requires a significant set of education and support resources. As a part of our development process the NAOI has created a support system that can be classified into four general areas as presented below. These are the products and services that the NAOI offers to both individuals and to financial organizations who want to enter the future of investing now and, by doing so, gain a massive competitive edge in a crowded market space. 1. Education - The NAOI is the nation's premier provider of investing education. Since 1997 we have taught thousands of individuals to invest via our books, seminars and college-level classes. As a result, we have in place the infrastructure needed to access a massive audience of current and future investors. We are currently deploying these resources to teach Dynamic Investment Theory and how to use Dynamic Investments. Most individuals will learn by purchasing The Amazing Future of Investing book is shown at right. For financial organizations we provide DIT education seminars that are discussed in more detail at this link. 2. Training Classes - The NAOI offers training classes on the art and science of Dynamic Investment creation, marketing, sales and support. There are elements of this process that are proprietary to the NAOI and can only be learned in our classes. And tools to create optimal DIS are needed that only the NAOI knows how to deploy. It took the NAOI 5+ years to develop DIT and DIs. We can teach an organization to become a very profitable DI designer, developer, marketer and seller in about a week. Learn more here. 3. Consulting - For financial organizations and professionals we offer customized consulting that will enable you to easily, efficiently and cost effectively integrate Dynamic Investment solutions into your current product offerings. And we can show you how to transition to the future of investing without disrupting current revenue streams. The elements of the DIT consulting process are discussed in more detail at this link. ETF Developer Consulting - A specialized form of consulting is available for ETF developers. We can show you how to multiply the value of your existing product line virtually overnight by exploiting the value that exists in ETF combinations. DIT uncovers massive value currently hidden in an ETF product line without the need to create a single new ETF. Learn more about this topic here and also here in the Author's Blog. 4. The NAOI Dynamic Investment Catalog - The NAOI has developed a catalog of Dynamic Investments and Dynamic Investment Portfolios that we offer to both individuals and to financial organizations. These are DI products that have been extensively tested and proven to consistently produce high returns with low risk in all economic conditions. These are DIs that individuals can start using today and that financial organizations can start marketing today! A special area on this site is presented specifically for the media. It can be accessed in the "Media Center" found here. In this section members of the media will find concise background information on why Dynamic Investments were created and how they will change the world of investing at a fundamental level, along with suggestions for articles that will inform your audience of how investing will work as a result of this change. Reporters will also want to include Hevner as a resource for comments and insights related to any article that involves how the world of investing works today and how it will work better in the future. 1. Email Updates: Join our Dynamic Investment Update Email List at the bottom of this, or any page of the site. We WILL NOT share your data with any third party and our servers are protected with the highest security levels. The NAOI is constantly developing new DIs and DI applications. If you are in this list you will be informed about them first! 4. Hevner's Author Blog: Read the Author's Blog on a regular basis. Here Leland Hevner discusses new Dynamic Investments released by the NAOI and new DI applications that we are developing - including how DIs revolutionize the Reitrement Investing industry. Contact us today with questions, comments or to simply discuss how you and/or your organization can benefit from working with the NAOI to take full advantage of the very different, but inevitable, future of investing as described on this site. Our contact information is found at this page: Contact Page.